The best thing I gave myself this year was a 10-day Vipassana Meditation course. Years ago, I was looking for a meditation class knowing that I had to go deep in my mind as a form of cleansing. I knew what I wanted: non-sectarian, in-depth, and stay-in. This year, I finally got myself a slot at the Vipassana Meditation Center Philippines. Ten days later, I felt like a different person. Vipassana is life-changing. The practice taught me to embrace impermanence and to make mindful choices. Vipassana was the catalyst that helped me to finally act on my beliefs. Mastering your mind (or at least the attempt to do so) is liberating. Waking up every day and meditating for almost 10 hours a day is ideal for monks staying in a monastery so imagine how tough it is to practice outside. When I do practice, I am reminded of the calm and clearheadedness that meditation brings. Also, staying there for 10 days feasting on vegetables set me on the right track to eating well. I haven't given up meat as of writing but the awareness is there. It always starts with awareness right? The only time I've purposely traveled alone was on an overnight trip for Chinese New Year in Miri. Even then, I enjoyed exploring Miri by myself. I went solo but I was never really alone because of Malaysians who took me in like family. They even took me to a place with a Pinoy band playing thinking that I must miss home after spending a month in Brunei. 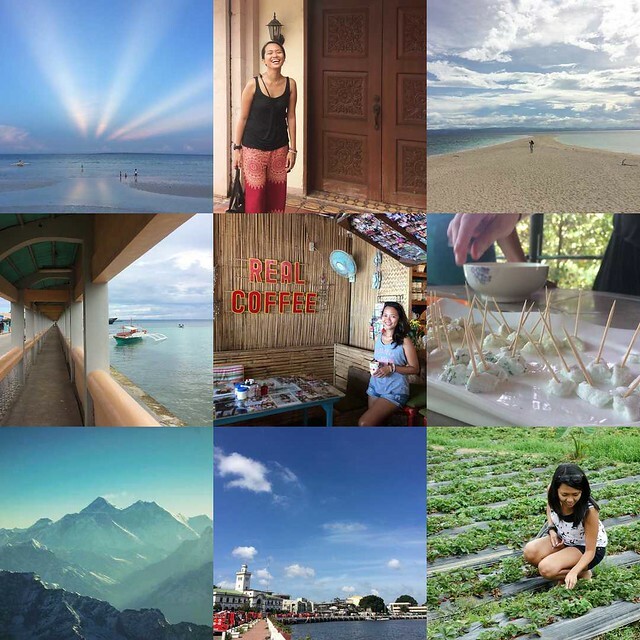 This year, I went on a month-long trip to Visayas. I've met with friends who came and joined me on some legs of the trip. Traveling with friends is fun especially if you are with like-minded individuals but going solo has its own perks. You can go anywhere (or not) and do anything (or not!) whenever you want to, without thinking of anyone else but yourself. Traveling solo is a challenge in itself but it is one thing I would gladly do again. It is not for everyone but how will you know if you never try? If I could dish out a tita advice for anyone in their teens and early twenties, it will be to go away by yourself at least once. To quit fawning over a girl or a boy and see the wonders of this world instead. To not be afraid of being your own person at the risk of sticking out like a sore thumb. To spend time in nature and to see how others live. To feel that you are but a speck in this vast universe and so you must not be always full of yourself. The sooner you realize this, the earlier you can be kinder to yourself and to others. I used to be guilty of making small talk because even though I felt fake, I have to do it because it is a culturally acceptable way of connecting with others. The truth is I hate small talk. I have declared a personal war against small talk. But even if I hate it because it feels unnecessary and a waste of time, I understand its purpose. We need small talk to make the other person feel comfortable. This year, I tried charging ahead, speaking out and asking what I really thought. I've asked questions of "Why are you here?" and in the midst of uncomfortable glances, I've been told of stories of heartbreaks, unconditional love, disenchantment, and the sheer desire for feeling alive. I live for these kinds of conversations and the most genuine and rewarding connections I've made were over deep conversations. However, I do understand that not all people are interested in conversations that make you think or bare your vulnerabilities so I sit back and indulge them. A good conversation is much like a breath of fresh air when you're up in the mountains. The memory lingers. I've always been ready for the next hangout or road trip but sometime this year a switch flicked and I thought "What am I doing here? Why am I here?" I knew then that my karen days were over. I don't know why it didn't use to matter but it does now. Since then, I have made mindful decisions as to where (and with whom) to spend my time. The best gift that you could give someone is your time so would you rather give it away to things that don't matter? Maybe it was the awareness of how impermanent things are (so you should make the most of it) or it's just me getting old that I no longer want to deal with unimportant things. I've lost all my FOMO this year. It couldn't have been any clearer. We make time for people who matter. We pursue the things that mean something to us. Everything else is a mere distraction. Period. This is the first year in my entire life that I could honestly say that I have been more understanding. It is one of the biggest things that Vipassana has cultivated in me. Whenever I am tempted to act out of anger or frustration towards a bad experience or a person, a little voice in my head says, "What is this person going through? What is this experience trying to teach me?" NEVER IN MY LIFE have I considered how the other person feels. I used to be so fixated about my own ego and thoughts. Even if doing it is a daily struggle, the awareness is so empowering that whatever emotions I may feel, from anger, disappointment, or hatred, I see it dissolve at the thought that before acting, I must first understand where the other person is coming from. Thinking before acting is not easy but it saves me from hating myself after I act impulsively. Coming from a place of love and compassion does not only mean treating others well but it also demands that you show the same high regard for yourself. It means self-love and self-respect. I joke about me being a tita all the time but if this is how titas go, I am accepting and embracing my titaness. So help me, universe. May we all have a fresh new start in life and love! This is my entry to the PTB Blog Carnival topic for this month, 2016: A Year Ender hosted by PinoyAdventurista (Mervin Marasigan). Also, small talk drains me, especially if it drags on too long. I love honest, authentic conversations. Maybe that's why I love solo travel and meeting locals or other travelers on the road - it usually leads into beautiful conversations. I read your blog. This is such a nice blog. I love to write travel's blog and I saw You have Best Travel Stories Blogs. Thanks For sharing this type of blog. Best article! Keep doing your thing, you're good at it! Portable and huge information are here unquestionably the two most huge mechanical speculations which any corporate travel office must concentration to make their stage all the more engaging.